Super Lube® Synthetic Extra Lightweight Oil offers the lightest viscosity of our Super Lube® Oil Product Line and should be used in place of conventional 5 – 6 cSt oils. 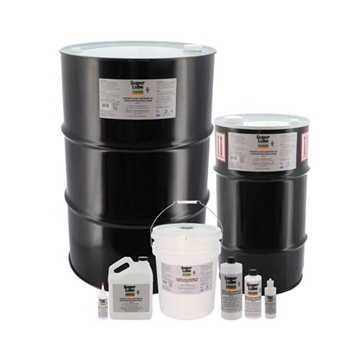 It is an ISO Grade 46 oil and has a temperature range of -40°F to 500°F (-40°C to 260°C). Super Lube® Synthetic Extra Lightweight Oil is dielectric, food grade, clean and environmentally friendly. It exhibits excellent performance in high pressure vane, piston and gear pumps, providing longer life and optimum performance. For rubber and plastic applications see Compatibility Chart under Technical Resources. Super Lube® Synthetic Extra Lightweight Oil is an NSF registered Food Grade lubricant, rated H1 for incidental food contact and meets former USDA (H1) guidelines. Super Lube® Synthetic Extra Lightweight Oil is Kosher Certified.